KNOXVILLE, TN. — NASCAR legend, Jeff Gordon, appeared as the keynote speaker Thursday night, July 11, at the annual induction dinner held at the Knoxville Convention Center. The event was a major fund-raiser for the Boys and Girls Clubs of the Tennessee Valley. Before speaking at the dinner, however, Gordon, 41 and visibly graying, was bombarded with questions from the media about his aging and driving performance. 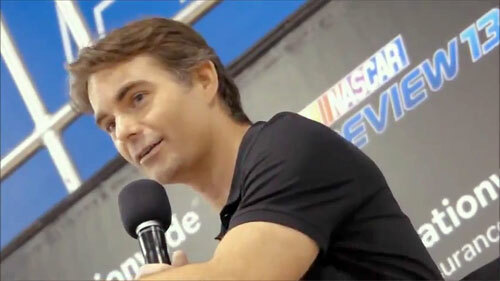 Photo shows Jeff Gordon speaking to media at the 2013 NASCAR Preview. “So you’re now the old guy out there,” Gordon kept hearing as he spoke with the local media. The Class of 2013 inductees included Bill Schmidt, an Olympic javelin medalist and trailblazer in the sports marketing industry, Bernadette Mattox, a member of Rick Pitino’s coaching staff at Kentucky, Neil Clabo, a punter at Farragut, the University of Tennessee and the Minnesota Vikings, Jay Searcy, an Oak Ridger who became a sports editor in New York and Philadelphia, Doyle Human, a long-time coach and official, Ed Irvin, recently retired as high school volleyball coach, Virginia Ann McGrath-Weaver, a record-setting swimmer at Tennessee, Holland Phillips, a Golden Gloves champion, Mary Ellis Richardson, a state tennis champion and former Lady Vols coach and George Underwood, who played basketball at Austin-East and East Tennessee State University. The Chad Pennington Professional Athletes of the Year award went to Chase Headley of the San Diego Padres and Randall Cobb of the Green Bay Packers for their outstanding achievements. Gordon, listed as one of NASCAR’s 50 Greatest Drivers, is a four-time series champion and a three-time Daytona 500 winner. He is third on the all-time wins list, with 87 career wins, and has the most wins in NASCAR’s modern era (1972–present). He is also the active iron man leader for consecutive races in which he participated. In 2009, Gordon became the first NASCAR driver to reach $100 million USD in winnings. Gordon drives the No. 24 Drive to End Hunger/Axalta Coating Systems Chevrolet SS for Hendrick Motorsports in the NASCAR Sprint Cup Series. Sports Speakers 360 is a sports talent agency for booking athletes. If you would like to book NASCAR drivers appearances like Jeff Gordon for a speaking event, autograph signing, VIP meet and greet, charity fundraiser, personal appearance, celebrity golf tournament, endorsement, social media campaign or corporate event, you can contact Jeff Gordon’s agent for appearance fees and booking information or call 1.855.303.5450.